RALEIGH, N.C. - May 10, 2018 - PRLog -- Saint Mary's Head of School Brendan J. O'Shea is pleased to announce that Katlyn Grasso, founder and CEO of GenHERation, has accepted the invitation to serve as Saint Mary's 2018 commencement speaker. Commencement exercises for Saint Mary's 176th academic session will be held Sunday, May 20, 2018, 10:30 a.m., in the school's historic oak Grove in downtown Raleigh. Seventy-two seniors will graduate in the Class of 2018. 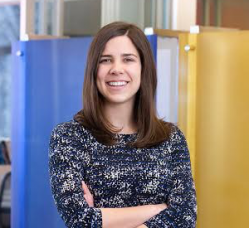 Katlyn Grasso is the founder and CEO of GenHERation, a network in which young women and companies connect through a digital platform and national events. Grasso recently graduated with a B.S. degree in economics, with a concentration in finance and strategic globalization, from the Wharton School of the University of Pennsylvania. As one of the inaugural recipients of the President's Engagement Prize at the University of Pennsylvania, she was awarded $150,000 "to develop innovative projects that have the potential to change the world." Known as a "serial entrepreneur," Grasso started both Taps for Tots, a dance exercise program, as well as a technology commercialization venture. A native of Hamburg, New York, Grasso is a bicoastal entrepreneur dividing her time between New York City, Philadelphia, and California. Grasso has appeared on various television and radio networks, including CNBC, NBC New York, and Sirius XM Radio, to name a few. Grasso's dedication to helping young women has shined through multiple GenHERation projects, including GenHERation Summer Leadership Series (created by Grasso), GenHERation webisodes, and she grew the entire GenHERation community to 60,000 plus members. Seventeen magazine took notice of Grasso's work, naming her as a Power Girl in the magazine's list of Real Girls Doing Amazing Things. Grasso is a relevant and accessible role model for Saint Mary's School students," says Head of School Brendan J. O'Shea. "Her energy and entrepreneurial spirit will be an inspiration to the graduates at commencement this year." By all accounts, Saint Mary's commencement embodies personal touches of academic excellence, personal achievement, friendship, tradition, grace, and courage that are hallmarks of the Saint Mary's experience. Saint Mary's School in Raleigh, N.C., is an independent, Episcopal, college-preparatory, boarding and day school, dedicated to academic excellence and personal achievement for young women in grades 9-12.